If your family is like ours, your precious pet is probably treated like one of the family. With these gifts from Petmate and MuttNation Money Saving Parent's dog Toby is set for a very happy holiday. 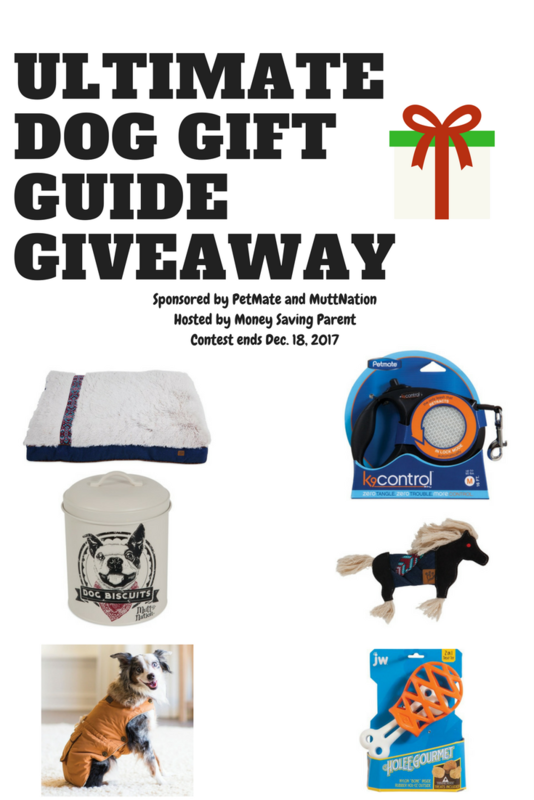 We would like to make your holidays a happy one too, by sharing with you this Ultimate Dog Gift Guide and Giveaway! MuttNation Treat Tin : With a vintage inspiration and retro design, this metal canister makes the perfect treat holder. Big enough to hold kibble or biscuits, rawhides, training and dental chews. Stands nine inches tall. Holds 12.5 cups/ 3 liters. MuttNation Braided Animals: Inspired by vintage animal toys, this new toy collection features a Cow, Pig, and Vanner Horse (Miranda’s favorite). With handmade patchwork stitching and trim, these toys include multiple strips designed to tuck and hide your dog’s favorite treats and crinkle fill for interactive play. MuttNation Guitar Strap Gusset Bed : The Guitar Strap Gusseted Pillow bed features a luxurious long-pile plush sleep surface and extra filling – four pounds of recycled polyfill – providing superior sleep and support for your pet. This super-sized bed is designed in blue tones and inspired by Miranda’s vintage guitar straps. The K9 Control Retractable leash is perfect for taking your dog for a walk rain or shine, snow or sleet. Money Saving Parent wishes her neighbor had used it the other day retracting their dog back from her Christmas decorations in the front yard before he peed on them. Available for dogs sized up to 120 lbs, this leash keeps in a locked position not allowing the dog to move forward as you retract them. The handle is molded for a nice grip and is a lot more comfortable. Everyone in the house from kids to adults can use it. With it getting dark early during the winter many pet owners are taking walks in the dark so the reflective insets and webbing for increased visibility at night are a big bonus. Best of all for me, no tangles! Money Saving Parent has been using the JW Hol-ee Gourmet Turkey Treat Toy in conjunction with the Calmz to treat her dogs separation anxiety. Filled with treats and frozen it distracts him for a long, long time. While battling the colder winter temperatures, don’t forget your four-legged family members! Little doggie coats, like the Wouapy Doggie Coats, are great (fashionable) solutions for the smaller breeds to keep them warm, but still mobile while outside. Calmz Anxiety Relief System. It is a non-invasive, drug-free system that soothes common anxieties and helps naturally combat the stress of traveling, loud noises and strangers. We've been using it for a few weeks now (as there is a period of adjustment) and have been really happy with the results. You simply place the harness on your pet some time before you leave and use one of the several settings. There are tones and vibration at a pressure point which are meant to calm your dog and help with anxiety. Designed in blue tones to match almost any décor, this brushed plaid or denim lounger features a luxuriously soft Lambswool sleep surface. The bed is perfect for snuggling and curling up when it is time to rest. Every dog lover knows that a dog comes with the most precious gift “FREE LOVE” - everyday, anytime and in every way. Designed in a retro distressed blue and red cotton, with a soft cotton backing for extra comfort. Available in three sizes S-M-L. Inspired by Miranda’s vintage guitar straps, this adjustable collar is perfect for any dog looking for some extra swagger. Available in three sizes S-M-L and constructed with extra soft neoprene backing for comfort. The design is also translated into a harness for extra support and safety, available in XS-S-M-L sizes. The mission of MuttNation Foundation is to promote and facilitate the adoption of shelter pets, encourage spay & neuter for all pets, and educate the public about the importance and beneficial impact of these actions. Our objectives are accomplished through numerous initiatives which include: high profile adoption events, fundraising events, a national pet transport network, and providing financial support to carefully vetted shelters across the United States. One of the many reasons I love products from PetMate and their friends at MuttNation is because they not only have beautifully crafted country style pet products designed by Miranda Lambert but also because when we make a Mutt Nation purchase our purchase helps fund the rescue and adoption programs of MuttNation Foundation. To help shine the spotlight on rescue animals and shelters, Miranda and her mom Bev Lambert founded MuttNation Foundation in 2009 to ensure that as many dogs as possible would have a safe and happy place to call home. In keeping with their commitment to providing monetary, hands on, and transport assistance during times of emergency and disaster. I remember just a couple of months ago MuttNation Foundation and Miranda Lambert helped with the many full shelters in the Houston area to make room for those animals lost, misplaced, discovered and damaged due to Hurricane Harvey. MuttNation Foundation is qualified as a tax-exempt organization under Section 501(c)(3) of the Internal Revenue Code. Donations are tax-deductible to the extent provided by law. Enter for your chance to win these SIX GIFTS for your precious pet! One lucky reader will win a MuttNation Braided Animal Collection (styles vary), MuttNation Treat Tin and MuttNation Guitar Strap Gusset Bed, K9 Control Retractable Leash, JW Hol-ee Gourmet Treat Toy (selection varies) and a Wouapy Outdoor or Bubble Coat . Sweepstakes ends December 20th at 3:00 pm ET. Money Saving Parent, nor any other blog on which this giveaway may be shared are not responsible for prize fulfillment. My favorite is the Wouapy Fashion Dog Coat in Extra Large. I love the MuttNation Braided Animals. My dog LOVES toys, and this one looks like it would be a favorite. He wears a medium size.